Ingredients when reconstituted: potato, onion, maltodextrin (from wheat), carrot, wheat starch, wheat flour, green beans, sugar, spices, currants, salt, natural flavours, yeast extract (contains milk derivatives), sunflower oil, colour (caramel IV), preservative (sodium bisulphite). Allergens:Contains wheat, milk products and sulphites.Manufactured on equipment that also processes products containing soybean, peanut, egg, sesame, fish and crustacea. 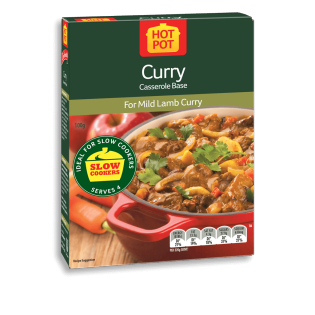 MILD LAMB CURRY Serves 4 500g cubed boneless lamb, or 1kg stewing chops 1 tablespoon oil 2 onions, sliced 1 packet Curry Hot Pot 2 cups (500mL) water 1 apple peeled, cored and diced 2 tablespoons fruit chutney 1 banana, sliced 2 tablespoons sultanas STOVE TOP Preparation: 15mins Cooking 30-90 mins Brown meat and onions in hot oil, in batches if necessary. Add Hot Pot, water, apple, chutney, banana and sultanas. Bring to the boil, cover and simmer gently until meat is tender, stirring occasionally. Allow 20-30 minutes for tender cuts; 1 - 1-1/4 hours for less tender cuts or meat on the bone. For other cooking methods like oven or slow cooker see pack instructions.